Hawaii Native Status: Introduced. This weed is native to Europe and parts of Asia. 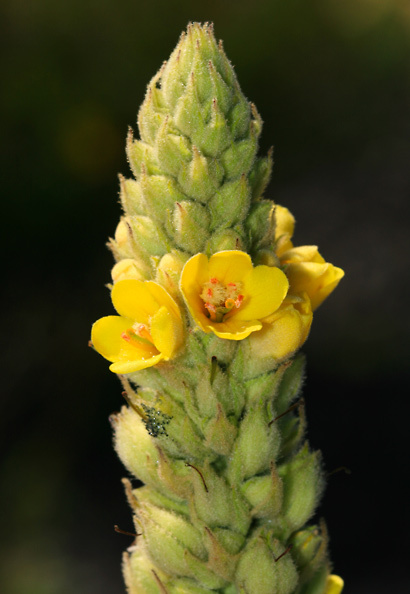 Height: The flower stalks are up to 6 feet (1.8 m) tall. Description: The flowers are clustered on tall, stout flower spikes. The individual flowers are up to 1 inch (2.5 cm) wide and have 5 lobes and 5, orange-tipped stamens. The flower spikes dry to a dark brown color on the plant. The leaves are grayish yellow-green, covered in dense, felt-like hair, and oblanceolate to egg-shaped. The lower leaves are in a basal rosette, while the stem leaves are alternate and become progressively smaller up the stem. The leaves are delightful to touch because they are very soft and velvety. Since the leaves are so fuzzy, they can easily trap and hold moisture and are thus frequently covered in water droplets. The first year plants are only a basal rosette of leaves. The second year plants have tall flower stalks and will die after blooming and setting seed. 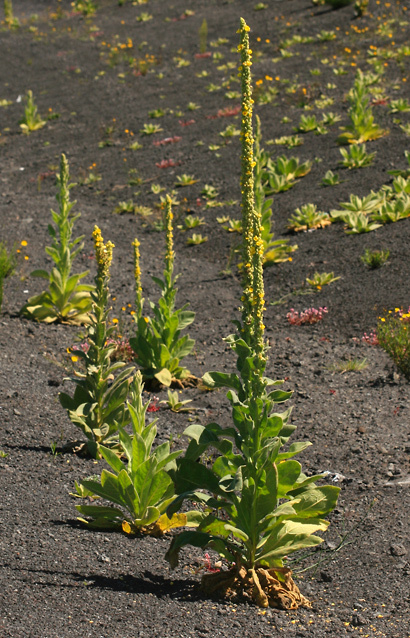 Here in Hawaii, Common Mullein is abundant along roadsides in upland areas on the Big Island of Hawaii. The similar Wand Mullein (Verbascum virgatum) and Moth Mullein (Verbascum blattaria) don't have velvety hairy leaves. 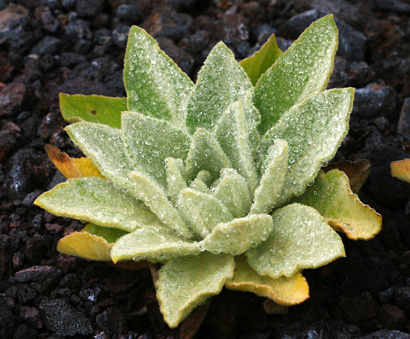 Legal Status – Hawaii State-listed Noxious Weed. This invasive and abundant weed is primarily a problem in upland areas above 5000 feet (1524 m) in elevation.